The Park Lane Hotel is situated between Green Park Station and Hyde Park Corner Station, each approximately a 5-minute walk from the hotel. The Piccadilly, Victoria and Jubilee lines run through Green Park Station. The Piccadilly line runs through Hyde Park Corner. Note: The Piccadilly Line runs from Heathrow Airport directly to Green Park Station, the station is a short walk away from the hotel. 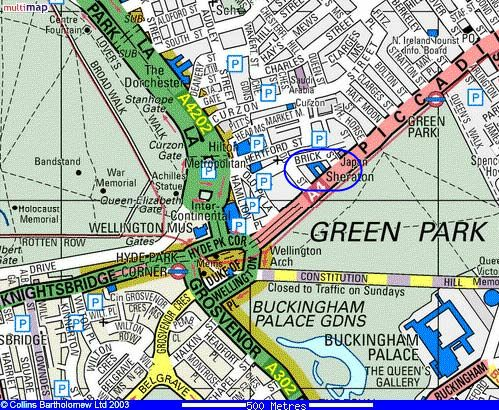 Green Park Station is also situated on the Victoria Line & Jubilee Line. Tickets & travel cards can be purchased from the travel desk. Note: The Heathrow Express train departs from Heathrow airport and arrives at Paddington Station, the station is a short taxi ride away from the hotel. Single & return tickets can be purchased from the travel desk. Note: The Gatwick Express train departs from Gatwick airport and arrives at Victoria Station, the station is a short taxi ride away from the hotel. Single & return tickets can be purchased from the travel desk. Note: The Stansted Express train departs from Stansted airport and arrives at Liverpool Street Station, the station is a taxi ride away from the hotel. Single & return tickets can be purchased from the travel desk. Leave the A1 (m) at Junction M18J2/ A1J35 and straight ahead onto M18. Leave M18 at junction M1/J32 and straight ahead onto M1 direction Nottingham (M1), The South, London. (after 150 miles from this junction) Take the 4thExit off the Staples Corner Roundabout onto Staples Corner West. After 140 yards, take the 1stExit off the Staples corner West onto Edgware Road. The Park Lane entrance for cars and car parking is on Brick Street. London (E) via A12 The City. There are also several NCP Car parks behind The Park Lane Hotel, in Shepherds Market and at the Hilton Park Lane if the Park Lane Hotel car park is full.